HÀ NỘI — After six decades of competing in the Olympics, Việt Nam boasts its first ever gold medal thanks to shooter Hoàng Xuân Vinh who won the men’s 10m air pistol at the summer games in Rio de Janeiro. Col. Vinh, 42, scored 202.5 points in the final round, breaking the previous Olympic record. Felipe Almeida Wu of host Brazil won the silver medal, scoring 202.1 points, and China’s Pang Wei got the bronze, with 180.4 points. Wu was the leading contender for the gold in the event, having won two gold medals in the ISSF World Cup held in Bangkok and Baku. Wei bagged a gold in the 2008 Beijing Olympics. “This gold medal is a big achievement not only for me but for the whole country and the Vietnamese people. I hope my victory will encourage young Vietnamese to love this sport,” said Vinh. “I am proud of being a soldier. I thank my fans, coaches and family who are always side by side with me,” Vinh added. Vinh contemplated his last bullet longer than usual, earning an additional 10.7 points to surpass Wu’s result and gain the medal. “The last shots are very thorny. I always think that I must be strong when facing difficulties. I gathered my wits, took a deep breath to regain my composure to compete better,” said Vinh. Prime Minister Nguyễn Xuân Phúc sent a letter to congratulate the Việt Nam delegation after hearing the news. “I am very glad to receive the good news. He became the first Vietnamese athlete to step up to the highest peak of world sports. Vinh’s result brings honour to the country, and pride for officials, coaches, athletes and Vietnamese fans,” Phúc said. “On the occasion of this event, I send my congratulations to the whole staff, experts and coaches of the Việt Nam team, and especially to Vinh, and the trainers and athletes of the shooting team. I hope the Việt Nam delegation will promote their achievement, raise solidarity and strive for more results in Brazil,” he said. Vinh’s gold medal was also an emotional achievement for many in Việt Nam. “I am crying when hearing that Vinh won a gold medal. Vinh brought Việt Nam pride in the world’s biggest sports event. I thank him very much and wish him health and success,” Nguyễn Minh Tuấn said on Facebook. “Vinh did an extraordinary thing,” said Nguyễn Hồng Minh, former head of the Elite Sport Department of the National Sports Administration. 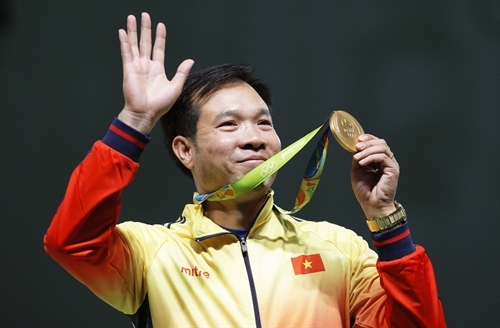 According to coach Nguyễn Thị Nhung, Vinh’s medal is a result of an arduous training process. Vinh won many medals in tournaments in the country, SEA Games as well as Asian and world events. “But Vinh lost in the Asian Games in 2010 and 2014, London Olympics in 2012 and now he overcame himself and leading rivals in the world. It is a honeyed achievement,” said Nhung. 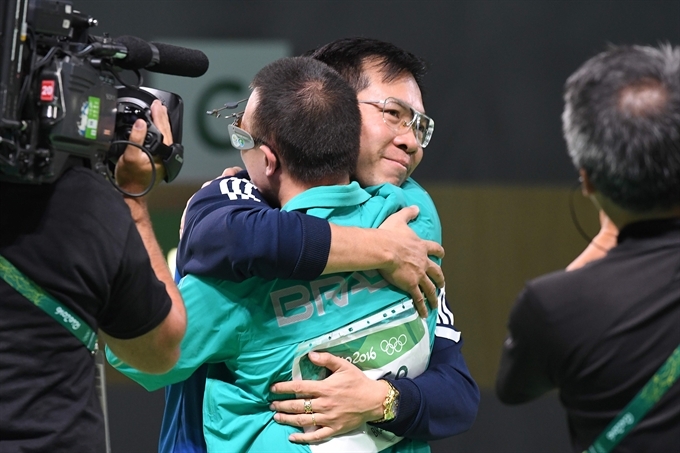 The 2012 Summer Olympics in London ended in heartbreak for Vinh, who finished ninth in the men’s 10m air pistol in the qualifying round, failing to make the cut for the final by a single point. He also failed to win a medal, taking fourth place in the men’s 50m pistol final, with a score only 0.1 less than the winner of the bronze medal. In past Games, Việt Nam won two silver medals. At the 2000 Sydney Olympics, Taekwondo martial artist Trần Hiếu Ngân won a silver medal in the women’s 57kg. At the 2008 Beijing Olympics, weightlifter Hoàng Anh Tuấn broke out with 290kg to win a silver medal in the men’s 56kg . In other news, Vinh’s teammate, Trần Quốc Cường ranked 26th in the qualifying round in the men’s 10m air pistol. Judoka Văn Ngọc Tú defeated Valentina Moscatt of Italy but lost to Jeong Bo Kyeong of South Korea in the 1/8 round of the women’s 48kg. Fencer Nguyễn Thị Như Hoa lost to Auriane Mallo of France 7-15 in the qualifying round. Gymnast Phạm Phước Hưng was 28th in the qualifying round of the men’s parallel bars. Weightlifer Vương Thị Huyền failed in the women’s 48kg.